and are designed for different applications in mind, it would be hard someone to tell you what would work best for you. You must be willing to research and understand your clients needs and abilities to make a good choice for their CMS. My experience has taught me a valuable lesson that I will share with you in hope to help you make the best choice for a CMS. A few months ago I recently designed a site for Honeyville Farms store locations. Basically, this site's main function is to help people find the closest location to them. The second goal on for the site required each store location to have it's own page which could be updated by each respective store manager. This would lead me to implement my first content management system (CMS) for a client. 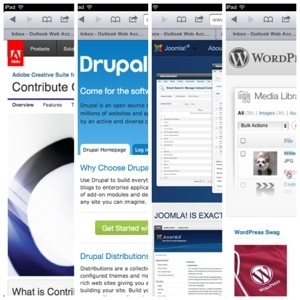 I started out researching CMSs and I instantly went to WordPress, then to Drupal, then Joomla, and even looked into adobe's solution to CMS called Contribute. What I was looking for in a CMS was the ability to simply be able to define tags within the site to have multiple editable regions on any given page. My reasoning for this was to have total control over the site design giving it a much more custom tailored look and feel and not be limited to one editable region per page. I ended up choosing adobe's contribute software knowing that it supported this out of the box. After using and fiddling with the contribute software and it's functionality with Dreamweaver for the past couple months, I have come to the conclusion that the software is quite complicated for our store managers to use. The users of the Contribute CMS are constantly contacting me, asking for help with the simplest tasks like uploading and placing an image and how to use repeatable regions. The sad thing is that I even showed them all how to use the CMS in detail. Though the software is pretty self explanatory, it really is tough for them to understand how it works. There seems to be too many options for them and the most common tasks are hidden in the interface making it hard for the users to do and to remember how to do what they need to do. Fortunately I have recently came across Pagelime which must be the simplest CMS I have yet to see. You can see my past post on Pagelime for an in depth review of the platform. Ps. If anyone knows of a better platform please leave a comment below. On that note this has led me to make the decision to interact with the store managers and collectively decide if Pagelime would be a better fit for our company. I am looking forward to resolving this issue by making the site easier for the store managers to update it's content. So, when it comes down to choosing the right CMS, you must understand who will be using it. Because, in the end, the user must have a pleasant experience they must not be forced to think. As designers we must remember to keep it simple. Know what the user's learning curve is and then you can decide if you can use a complex CMS or a simple CMS.